The largest airplane on earth, the Antonov 225 Landing at Perth Airport on Runway 21 at 1151 AWST on 15 May 2016. Be sure to set the quality up to 1080p for best viewing. The quality is not the best as I didn’t have a front row seat and was recorded on an iPhone. 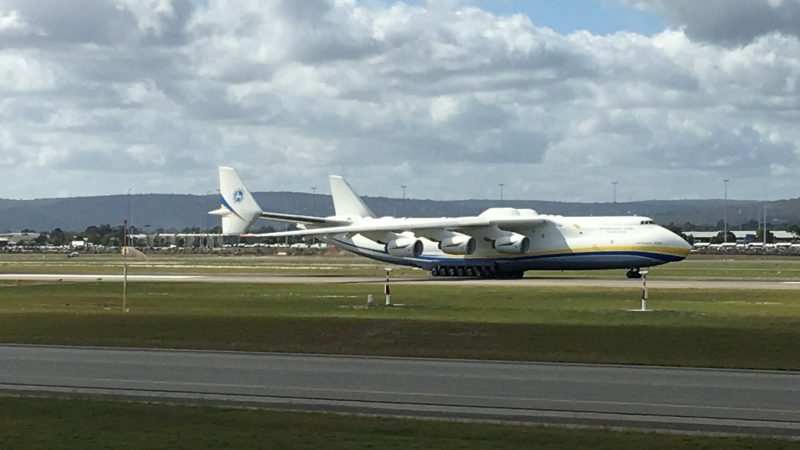 This is the first time the Antonov 225 has landed in Australia. It is delivering a 100 tonne generator for a mining company. This is a raw video of the plane landing and taxiing. There were approximately 500 people at the Perth Airport Observation Platform on Dunreath Drive and a further 10,000+ on the other side of the airport. At around 2:10 into the video you will see the first officer wave the Ukraine flag out the window to cheers from the crowd. I traveled from Sydney to Perth and waited 7 hours in the cold and sometimes rain to see this plane and I have to say, it was worth it!